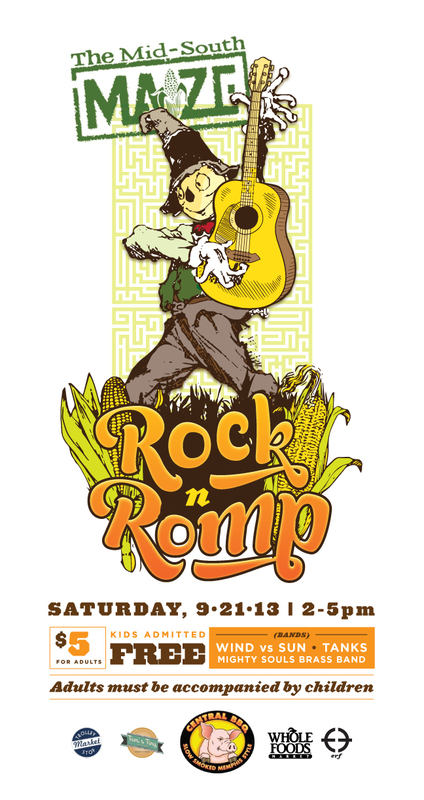 Come Rock-n-Romp with us at the Mid-South Maze on September 21st from 2-5pm. We'll have Wind vs. Sun, Tanks, and the Mighty Souls Brass band playing. $5 Adults/kids free. Adults MUST be accompanied by children. As always bring a blanket or a chair, a snack to share, and earplugs for the little ones. There will be free beer from the Bluff City Homebrewers & Connoisseurs, free food from Central BBQ, Tom's Tiny Kitchen, Trolley Stop Market and Whole Foods.